NHL Central Scouting recognized former Los Angeles Jr. King Dustin Wolf on its final rankings of 2019 draft-eligibles, which were released today. Wolf, a 2001 birth year who stopped pucks this past season for the Western Hockey League’s (WHL) Everett Silvertips, is listed No. 12 among North American goaltenders. Wolf is coming off an impressive second season with the Silvertips where he continued the team’s legacy of strong goaltending. In 61 games, he sported a 41-15-2-2 record, including seven shutouts, to compliment a 1.69 goals-against average and a .936 save percentage. For the regular-season portion of his WHL career, Wolf has fashioned a 54-21-2-2 record in 81 games, sporting a 1.83 goals-against average, .934 save percentage and 11 shutouts. Wolf, a member of the 2018 U.S. Under-18 Men's Select Team that competed in the Hlinka Gretzky Cup last summer, was also named the WHL Goaltender of the Week for the weeks ending Oct. 28, Nov. 25, Dec. 9, Jan. 27, March 3 and March 31 and WHL Goaltender of the Month for December. 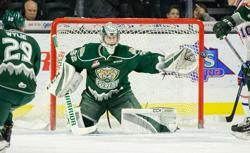 He was named the Canadian Hockey League Goaltender of the Week for the weeks ending Dec. 9 and Jan. 27. The 2019 NHL Entry Draft will be conducted on June 21-22 at Rogers Arena in Vancouver.